Kevin, Adam, Tim, and Jonathan talk TouchPad. We want you to introduce the PalmCast. Email us an audio introduction to podcast@precentral.net! Thanks to everybody for writing in! Thanks again to everybody for writing in as well as everybody that participated live in person and in the chat! Thanks to the PreCentral Store for sponsoring the PalmCast. 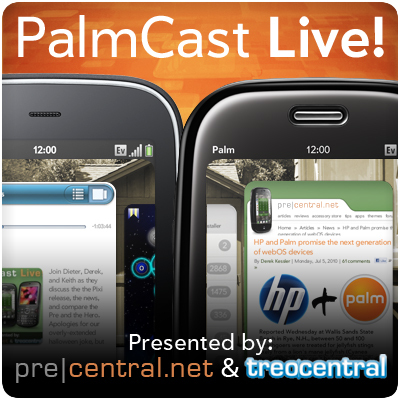 You can email the PalmCast at podcast@treocentral.com or leave us a voicemail at 800-557-6819 x222.